On my walks, I am accompanied by three sheep, a goat, and a dog. One of the sheep is tan-colored, and the others are white. 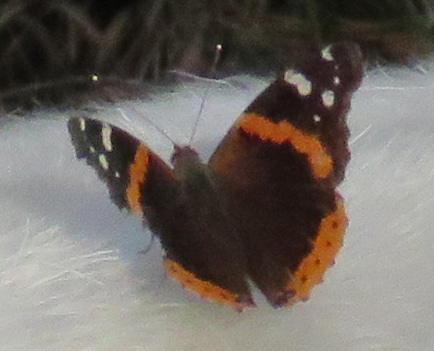 Yesterday afternoon this butterfly kept landing on the white ones (why not the tan one? I don’t know. Did the butterfly think the white ones were big flowers?). Even though their coats are thick for winter, they all noticed it, flicked their tails and shivered their skins to move it off. 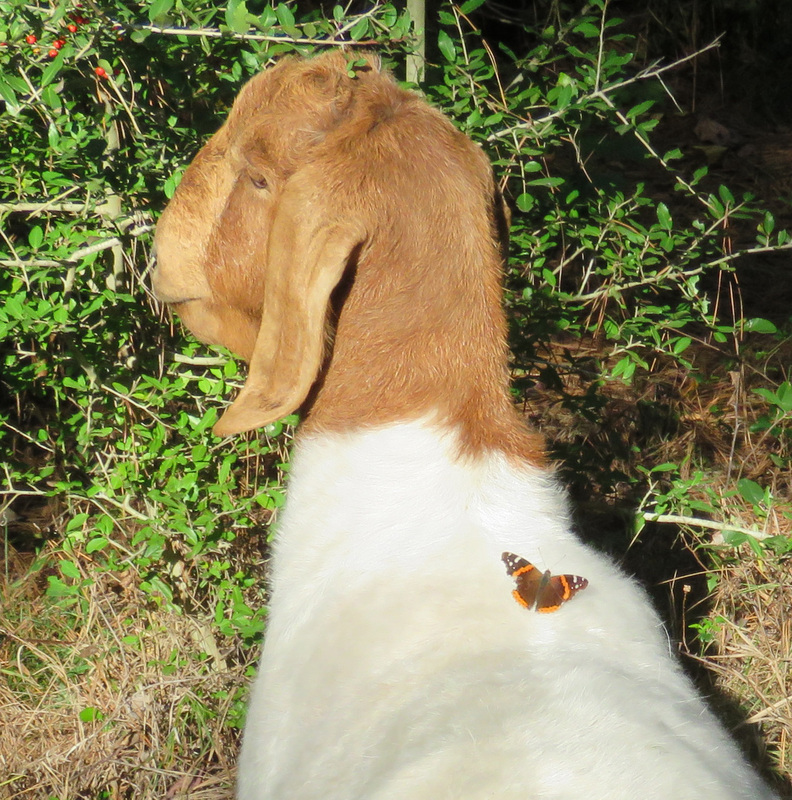 Red Admiral, Vanessa atalanta, on Boer goat. Finally it landed on a yaupon and I was able to zoom in. It shows evidence of a long hard summer, but it is still beautiful. 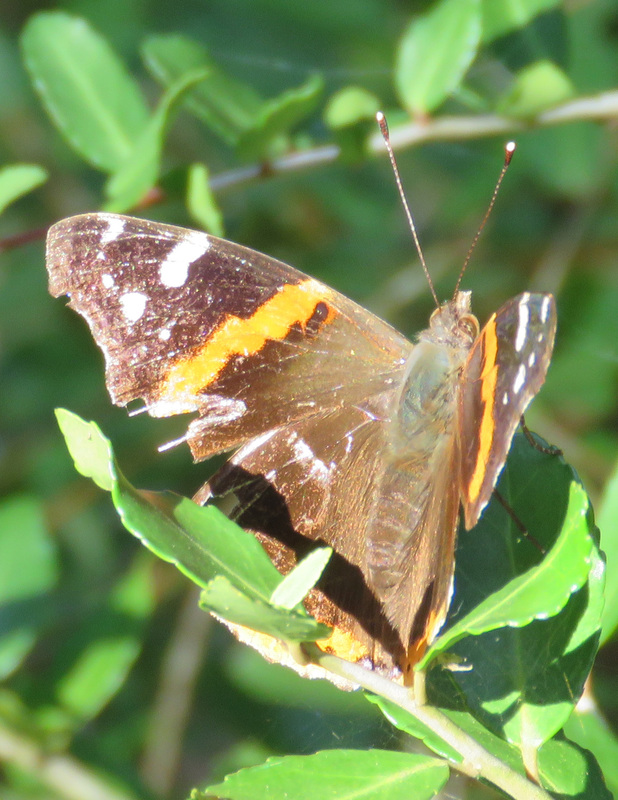 My Audubon Field Guide says that these butterflies are found year-round in the South, so it may have months of life left. 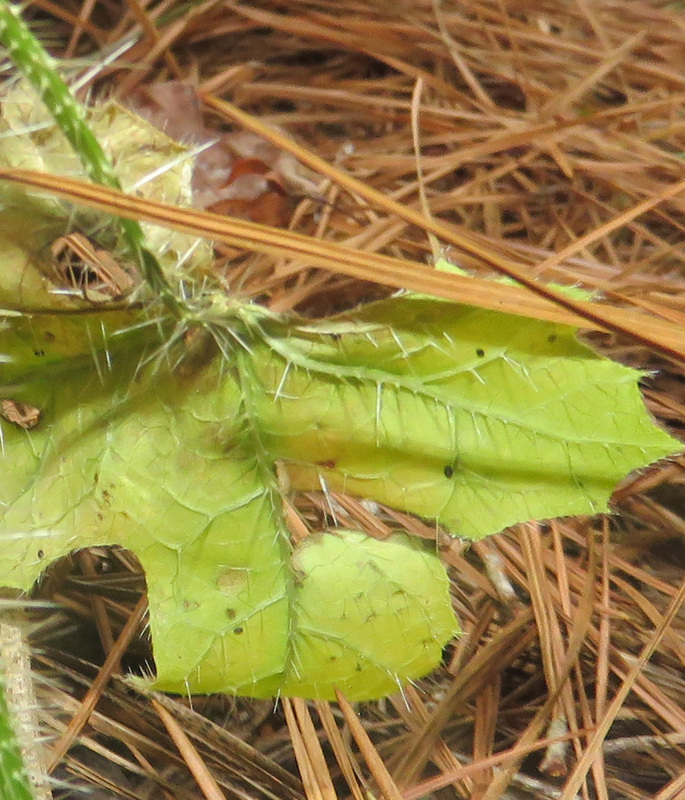 Bullnettle, also called Carolina horse nettle (Solanum carolinense). and I know I have never seen a caterpillar on it. 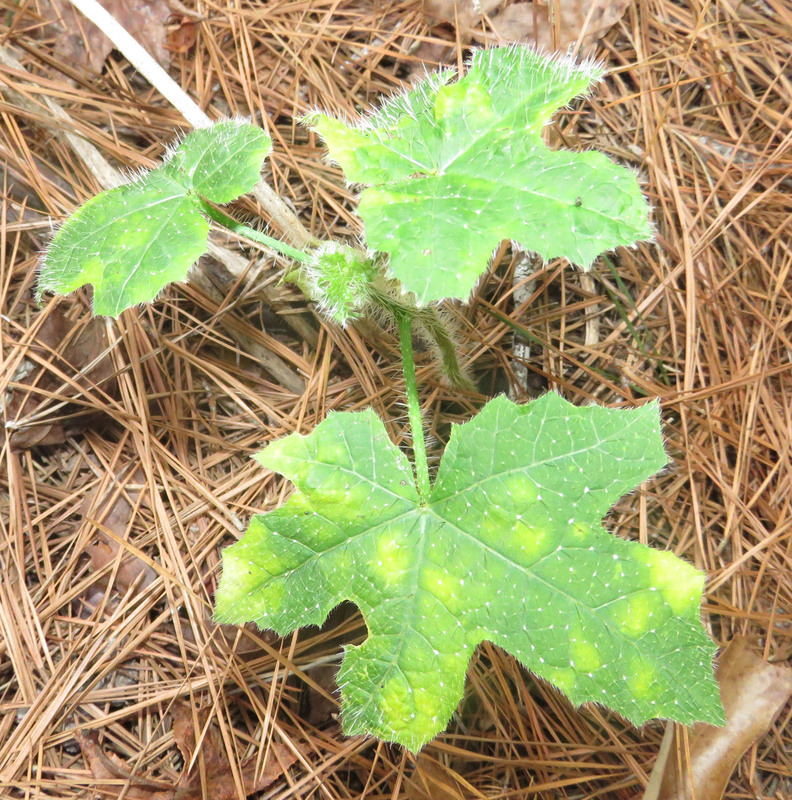 In researching further, I found out that it is not in the nettle family at all. It is in the nightshade family (along with another big spiny plant we have here that sounds delicious but is horribly irritating, Tropical Soda Apple, Solanum viarum). 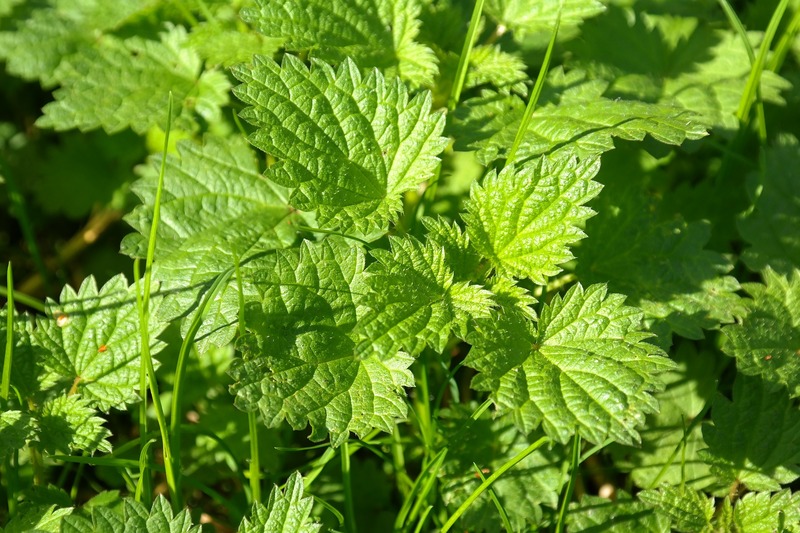 The real nettles of the family Urticiaceae are what the Red Admiral uses, and when I looked them up I realized we have those here too – they were growing all over in an old animal pen, and they looked like a nice innocuous mint. And then I tried to pull them. I am not sure of the exact species that grows here, and I don’t have one of my own pictures of them, so I am using this example from the nice people at Pixabay. In the spring, I will have to search those plants for caterpillars. I want to see a photo of you walking with your entourage . . .